Event Theme, Stage Design and Production, Event Invitation and Registration Process, Hall Branding, Collaterals Design and Production, Giveaway Branding and Production, Hostess Management and Uniform Design, Motion Graphics Design and Production, Event Animation, Event Management, Event Photography and Videography, Live Streaming, Corporate Presentation Design. 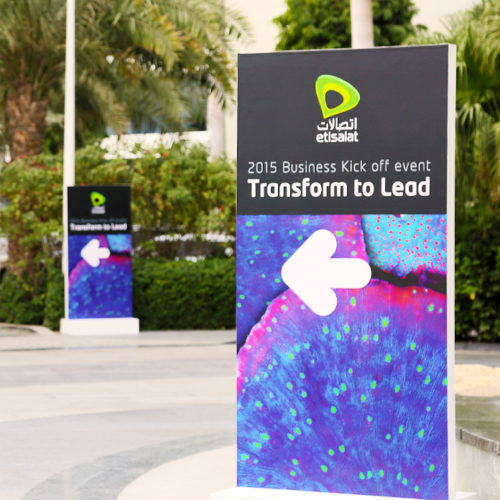 To celebrate 2014’s achievements and motivate their employees to grow even further in 2015, the Etisalat Business Units decided to host an internal event. 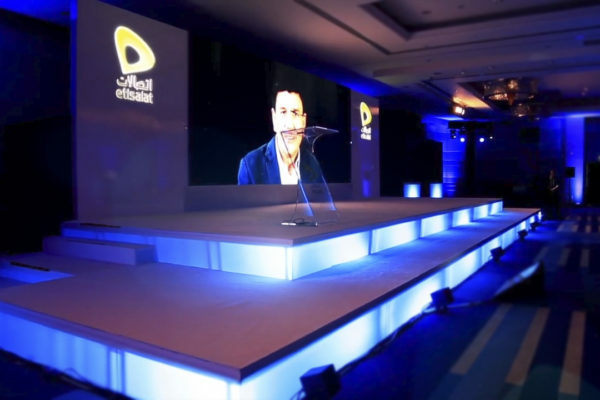 In order to create a powerful and encouraging foundation for 2015, Etisalat’s leadership chose the concept of transformation as their key precursor to growth. 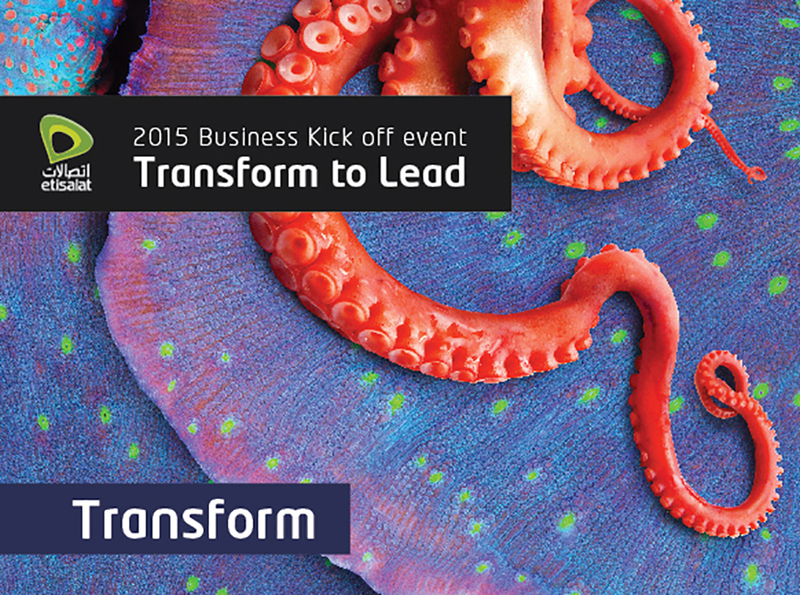 As such, the event and all its communication was built around the call-to-action,“Transform to Lead”. The challenge and our opportunity..
Our challenge began with finding a unique and exciting way to make Etisalat’s employees experience a true transformation at the event. We purposefully avoided typical avenues of motivation and did not want to fall into the conventional trap of misusing local symbols. We wanted to create a symbol for transformation that would fit perfectly within Etisalat’s current business environment and brand. 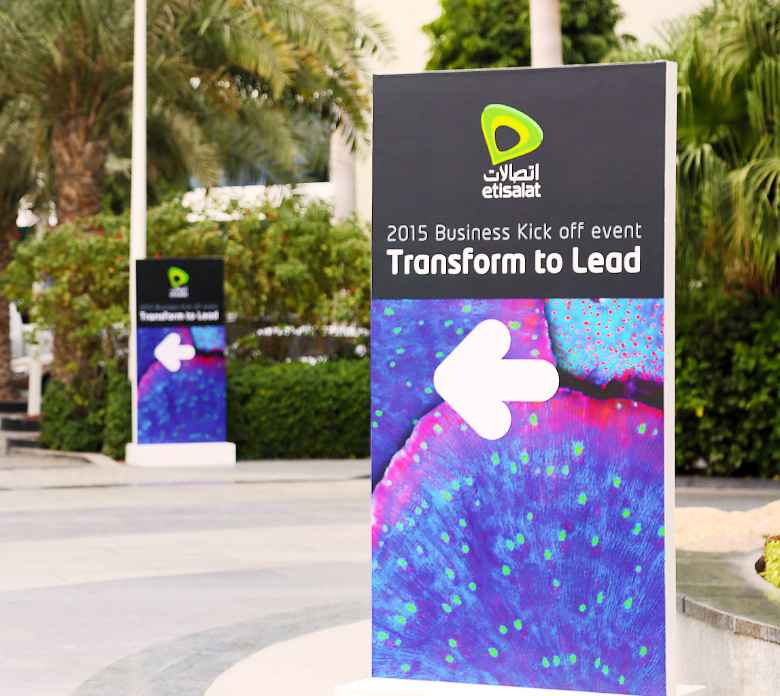 To the attendees, this symbol had to embody the ability for change as being key to Etisalat’s 2015 business strategy. 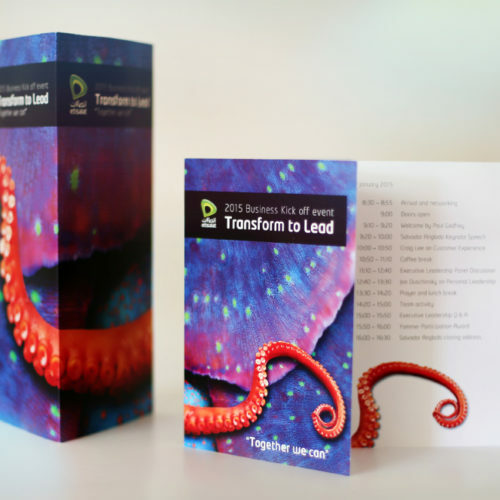 Just as importantly, “Transform to Lead” had to translate into an integral call-to-action by, and for, Etisalat. OH37 adopted the octopus as that symbol, utilizing its physical and mental adeptness to create the world of the event and engage its guests. 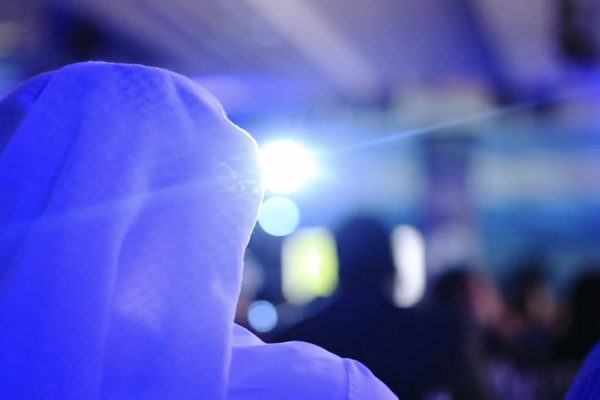 Through our comprehensive content planning, we opted for bespoke dynamic content in the form of 2D and 3D motion graphics to bring the concept of the event to life. Although the animations where in the background, they were consistently incorporated into the event, creating a form of entertainment that further reinforced the theme. The visuals integrated seamlessly with the design of the stage and space, enveloping the audience and propelling them into the world we created. 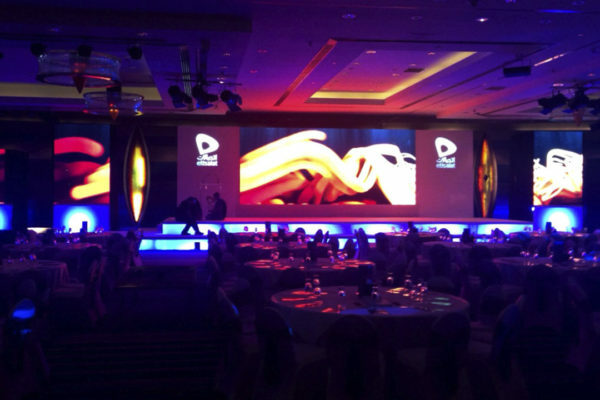 A venue designed to be both modern and elegant, our team organised and managed all aspects of this event. 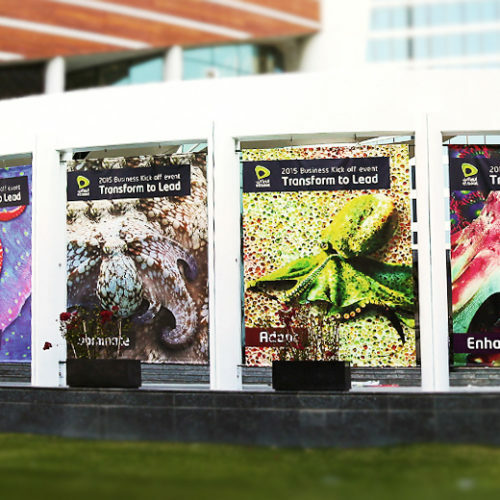 From the implementation of the QR reservation and digitized badge systems, to resource management, production and dress-up of the venue. Attention to every detail is important to us, especially when crafting the perfect experience. We made everything from customized chair slipcovers to hostess uniforms and outdoor flags; paying special attention to lighting design, since we wanted to create a completely immersive environment. In an effort to make the experience as smooth as possible, we ran briefings on managing traffic flow to the event. 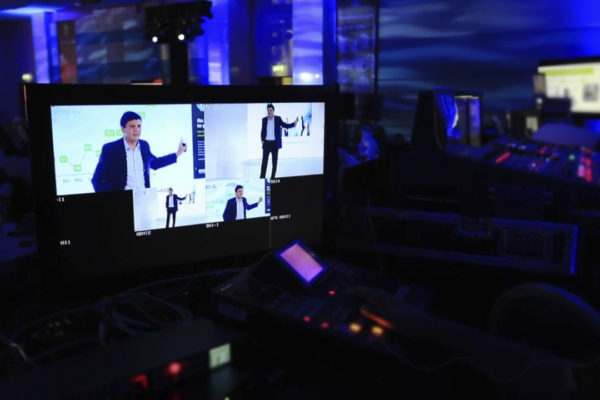 Our technical teams ensured operations were running perfectly while our film crews documented and broadcast the experience live. 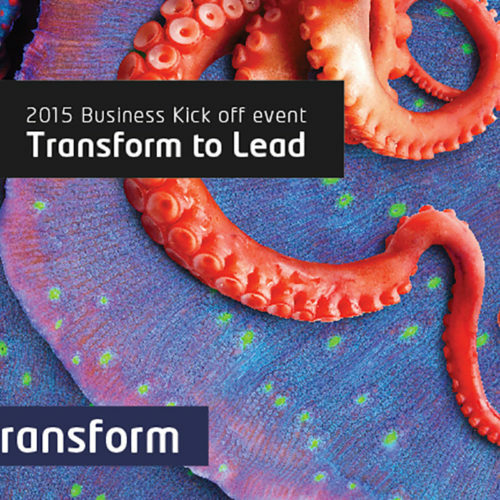 For the key visual we aimed to capture the event theme “Transform to Lead” by using a symbol that would embody all the traits that the sales teams should adopt in order to meet the years’ upcoming objectives, and to follow the CBO’s new strategy. We aimed to find a symbol that would stand for power, transformation, intelligence, and adaptability. We found that this magnificent animal posses all the traits and captures the events objectives. 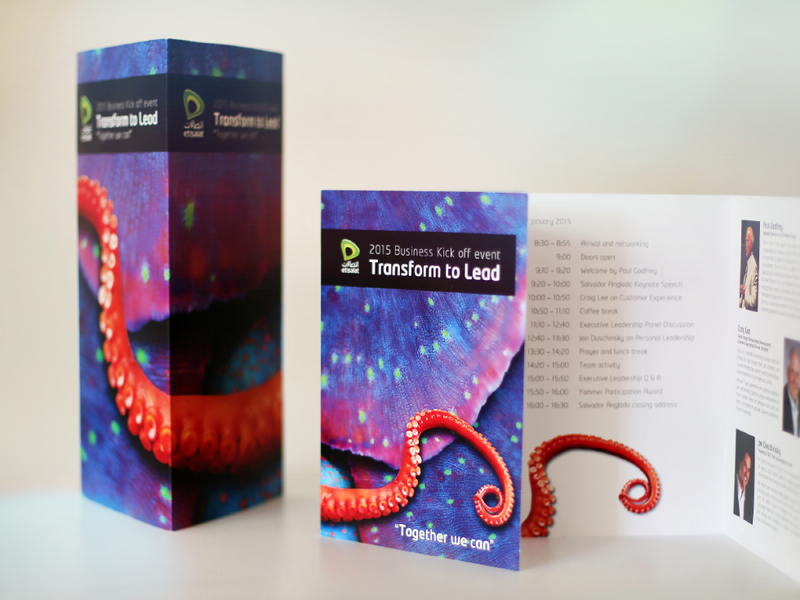 This theme and key visual were brought to life both on screen and across all event communication.